a3Genealogy: Were They Slave Masters or Abolitionists? Pro-slavery or abolitionists, our ancestors had a stand on the Underground Railroad. Many records have been saved for social and genealogical research. I wrote a piece on the Underground Railroads and Anti-Slavery Records yesterday in hopes of providing one more resource for African American researchers. But, then I started receiving messages asking was this an entire African American network, or a Quaker network? Was this a secret slave route designed by slaves? How do I know if my ancestor was involved? The answer: Your ancestor may have been involved, even if they had slaves, and even if they weren’t Quakers. This was a united effort that involved slaves, ex-slaves, Quakers (Society of Friends), Unitarians and other religious groups, and anti-slavery persons of all walks, from the southern slave-states to Canada. But My Ancestor’s Were Not Quakers! Most of the White people actively involved in the Underground Railroad were Quakers. But the Quakers did not stand alone. The Underground Railroad had supporters not just in Quaker-saturated Pennsylvania, but even in Vermont, there were 89 antislavery societies with over 10,000 members. Twenty one states were involved in the Underground Railroad. You may wish to become familiar with the routes. The best way to do this is to review a states’ Underground Railroad Stations. The National Underground Railroad Freedom Center has begun a list of biographies of “enslaved and freed Blacks, Whites, native Americans and others” actively involved in this effort. Although some of the surnames are known, the involvement of many whites (to include active women) are not. One such person was progressive Jane Swisshelm, a Scot. We’ve all heard of the ex-slave Harriet Tubman’s heroic position as a Conductor of the Underground Railroad. Conductors guided runaways from one station to the next, and Tubman fulfilled this duty around 15 times (13-19) to lead 300 slaves to freedom. But what about the other activists - the White abolitionists- who set up Stations, were Agents and Conductors; those who were also vital to the success of the network? We don’t often read of family genealogists who share their ancestor’s stories of involvement. Levi Coffin, the Quaker noted for assisting over 3000 slaves and who earned the nickname “President of Railroad,” was one of many Quakers who worked the Underground Railroad. The Coffin Station in Newport (Fountain City) Indiana was even the story behind slave Eliza in Uncle Tom’s Cabin. Levi and wife Catherine later continued to assist slaves in their Cincinnati home. 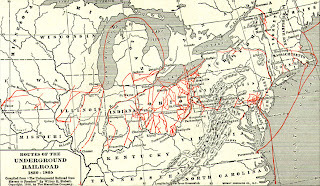 Along with the National Underground Railroad Freedom Center's list of names or activists, The Underground Railroad from Slavery to Freedom by William Henry Siebert and Albert Bushnell Hart, gives us over 3000 surnames; many are the white abolitionists who were Conductors, Agents or Station Masters. The Fugitive Slave Act was passed in 1850 and John Brown’s Harper Ferry raid was in 1859. Although the Fugitive Slave Act catapulted the abolitionist movement, John Brown’s capture put Station Masters at risk. The abolitionists, who clearly continued their work, avoided retribution by destroying most of the records detailing passengers, routes and meeting notes with Brown. However, perhaps your ancestor’s journals, names or information can be located within the National Union Catalog of Manuscript. This is the best collection, operated by the Library of Congress, that holds Fugitive journals and network information. Be sure to check for your ancestor. 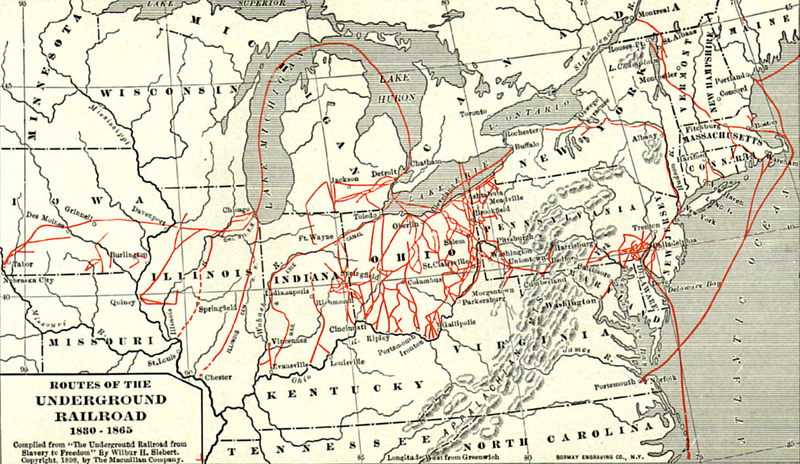 To research your ancestor’s involvement in the Underground Railroad, begin with a Map of the Routes. Did your ancestor live on the route? Remember, just because your ancestor had slaves, does not exclude their being abolitionists. And, just because they didn’t have slaves doesn’t mean they were supportive of the Underground Railroad. But check. Were your ancestors residing near the Stations? Check for court cases, slave habits, etc. if your ancestors lived within 30 miles of a station, or along a Route. Don’t forget to check some of the famous court cases involved. Did your ancestor attend Oberlin College during the John Price rescue in 1858 at Oberlin-Wellington? Over 35 persons were named in that famous case, many students. In towns like Oberlin, your ancestor probably took one side or the other. Both were named in the more publicized lawsuits as either witnesses or suspects. Again, court cases also name witnesses pro-slavery or those supporting the Fugitive Slave Act. Why not find out a bit more about your ancestor’s lifestyle and view on the times. P.S. 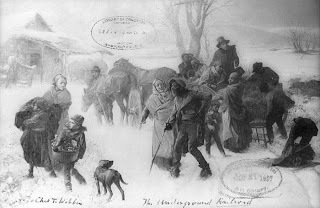 The Underground Railroad did not have trains, rails, or tracks, but secret passage routes.